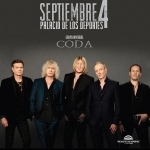 Def Leppard will be supported by local band Coda at the Mexico City show on 4th September. Coda were the support act in September 1993 for the two Mexico City shows. The last of the 17 month Adrenalize world tour and the very first time the band played here. Coda released four studio albums from 1990 to 1997 before the original lineup disbanded. They reunited in 2012 for the Reunion tour celebrating the 25th anniversary of the band. They plan to release a new studio album in 2015. The first one in 15 years featuring the original ineup. The two Mexican dates were announced on 24th June and are the first in the country since September 2012 on the Rock Of Ages tour.